Hiring managers will be curious about why you want to change jobs. They want to hear that you're leaving for the right reasons - a better opportunity, more challenges, and career growth. The interviewer will want to be sure that you aren't leaving your job because of poor performance, difficult working relationships, or because you hate your job or your boss. 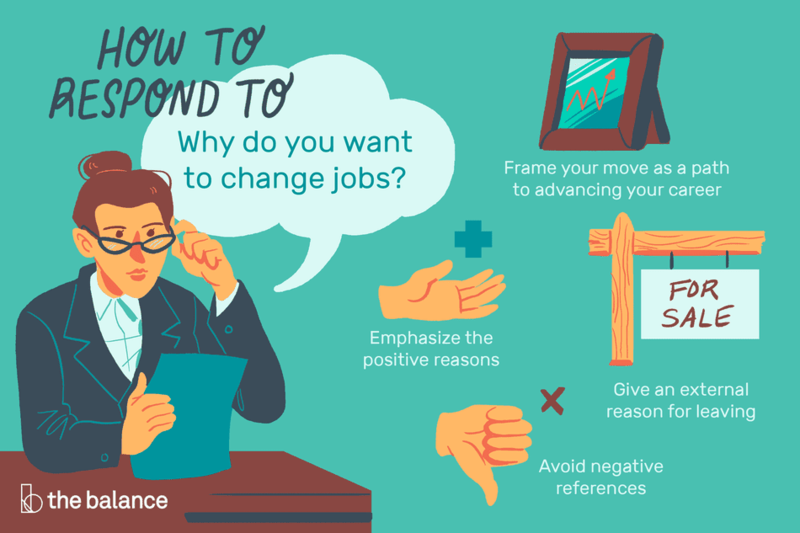 When responding to questions about why you are switching jobs, it's important to provide reassurance that you are moving on for the right reason, not just to get out of a bad work situation. Here are some approaches you can use to reassure the interviewer that you are leaving your job for the right reasons. Emphasize the positive reasons why you are targeting a job with their organization. Refer to specific aspects of the work, company culture, and employer which correspond well with your interests and skills. Placing the focus upon your potential employer subtly redirects the conversation from your previous work experience to your strong potential as their next employee. It is also a great way to show that you’ve done your homework in researching their company before your interview. Frame your move as a path to advancing your career without disparaging your current job. One way to do this is to reference the aspects of the new job which appear to carry more responsibility. Even if the new job doesn't have a higher status, you could mention that you believe it would provide a springboard for career advancement down the road - after you have spent appropriate time in your initial job with the employer and have mastered it. You might also comment that you feel that the job you’re applying for seems more aligned with your long-term career goals, which you should be prepared to discuss. Integrate positive references to your current job in your response, so that it is clear (or at least appears) you are not fleeing a bad situation. You are just seeking to improve upon an already good situation. Of course, you should avoid any negative references to management, to salary, or to the number of hours worked. Incorporate some positive reflections upon rewarding relationships with supervisors, co-workers and clients, whenever feasible. You might describe opportunities they gave you for career development, or discuss a particularly rewarding experience you had with a client. Consider giving an external reason for leaving. You might refer to factors such as relocating to a more urban area or looking for a job that is closer to home. But, be clear that this is not the primary reason that you are applying for a job at the organization, just an additional factor that contributed to your interest in the position. The primary emphasis should always be placed upon the fit of the job itself. Perhaps you can explain that you are seeking to take your career in a different direction or use your skills in a new way, and this position offers an atmosphere your old company was unable to provide. If it is a well-known (public) fact that your current employer has a shrinking market share or other financial problems, you might refer to this issue after making a strong case for why the new job is suitable. Be sure to avoid sharing any proprietary information or painting an overly negative picture of your current employer's situation, though. A vague reference to your employer's difficulties will usually be sufficient. It may be that your reasons for leaving your present employment aren’t entirely positive, and while you need to stay truthful, you can cast events in a light that reflects positively on you as well as avoids reflecting negatively on your former or present situation. It’s a good idea to think through your answers to the question of why you are leaving your present job, or why you were fired, quit or resigned. If you have had a gap in employment, you need to be able to address that as well. When you are seeking a job change, one of the questions the interviewer will have is if you are worth the risk of hiring. Having strong, positive responses to these issues will convince the hiring manager that you will be an asset to the company. While changing jobs for the right reasons is a positive, smart career move that shows you are ambitious and savvy, your interviewer will want to determine that you’re not a job hopper who is apt to only stay with the company a short time. They want to know that you are someone who can be relied upon as a valued part of their team.